The most highly-acclaimed visual novel series of all time is finally coming to the West, newly revamped and officially in English for the first time! An inter-dimensional love story that takes high school romance on a roller-coaster ride through the depths of despair, culminating in a sci-fi grand finale of epic proportions. Two games in one: Muv-Luv is comprised of Muv-Luv Extra and Muv-Luv Unlimited, the first two arcs of this epic saga. Western Release: This is the first time this grandiose story is release in English, with an official translation. 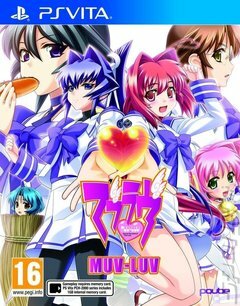 A Fresh New Look: Muv-Luv was fully revamped for this PS Vita release, with updated graphics, interface and game engine. It's A Roller-coaster Ride: Enjoy 70 hours of story in this two-part emotional visual novel. Romance Galore: discover 5 routes with 5 different girls and find your perfect match. Prepare For Battle: After choosing the girl of your dreams in Extra, wake up in an alternate timeline in Unlimited -where aliens have invaded. Mysterious Disappearance: In Unlimited, your best friend Sumika has been removed from the timeline... Can you figure out what happened? Mechas Take Flight: Discover your amazing pilot abilities and enlist to save the planet against an invasion of alien bugs.